We met at our graduate college orientation and the minute she knew I was from Mumbai too she jumped in excitement. She was talking like a dime to the dozen and in my head I was like “how much does she talk”. I don’t know how we hit it off but in a matter of few weeks we became rock solid. Both of us were poles apart in personalities, she hated fashion I sweared by brands, she hated makeup I swore by MAC, she hated going out I was always out, she was the one with a blue-print brain and lets not talk about me. She slept diligently by 9 everyday and I was a night owl party hopping from one place to another. Yes, but there was one thing common anyone rubbed us on the wrong side we would give even ROCK competition and we never shyed away from speaking our minds. Like they say you may not be similar but still there is something that binds a relationship. You’re “my person” because we are on the same team, we have our own language, because I know you will tell me what to do even if it is to shut the hell up, because even if you’re busy you will still do a tab check on me, you listen to all my crazy moments, you hear me complain about life and everything and still have my back, because we don’t have to say anything to understand each other, because family need not be blood related, because only we understand what we do, because you are “YOU” and you’re “my person” no one else is. You are the chalk and I am the cheese. I don’t think we both can annoy anyone as much as we irritate each other but are still inseparable. We both would make the perfect endorsement for two dissimilar people who still make a great pack.At times I feel I am living with a kid, but I love it. You make every day of my life challenging, but I still love it. I go to the movies alone at times so that I can enjoy my bucket of popcorn in peace without having to hear how many calories I am consuming. Every time you forget the parking slot in the mall, I think “seriously”. Every time my hands go looking out for a bag of chips and you give me the stern look “THAT”. You’re a gym junkie and it makes me wonder what did I get myself into. I hate it how you’re right most of the times, but I still try to stand my ground. Every morning when you sit with your bottle of water and stare at the ceiling, I wonder what the hell is there on the top. You bring out the best and worst in me. You make me think being dumb is cool. You let me be “ME”. You love Batman, I love Alice in wonderland. I wonder what a mundane, boring life I would be leading if you were not around to bug me. You’re a 29 yr old going on 19, pun intended. You make life seem like a breath of fresh air. I know you love me more, but I will never admit it.You make life colorful. 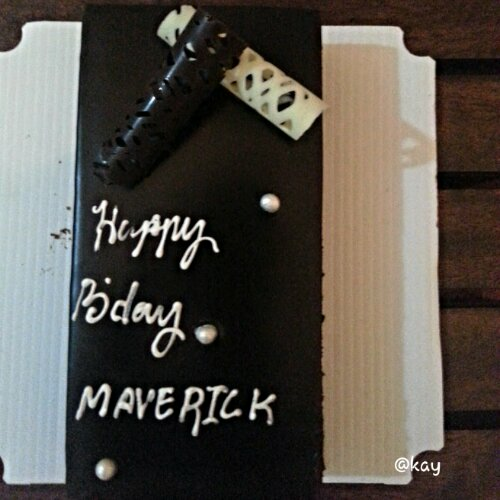 Happy B’Day Maverick, let’s go drink it up and make it a blast. I wouldn’t have wished for life to be in any other way. You make it bombastic. May all the candles you blow today bring you the best all year around. I Love You. Soulmates for life. Go get your six pack now.